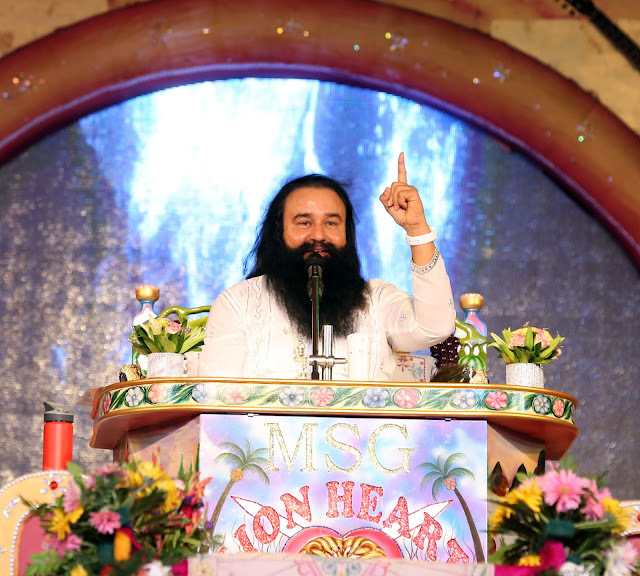 A bhandara was organized in Sirsa, Haryana commemorating the 69th Foundation Day of the Dera Sacha Sauda and the 10th anniversary of the Holy Nectar “Jaam-e-Insan”. The 2-day event saw devotees from various parts of India and the world flocking to Sirsa to seek the blessings and teachings of Revered Saint Dr. Gurmeet Ram Rahim Singh Ji Insan. This auspicious occasion also witnessed an International Cultural Festival as artists and performers from around the world showcased their talents. The Revered Saint graced the stage in the get-up of his 5th upcoming movie Jattu Engineer to a thunderous applause and a standing ovation from the audience. Everyone present clamored for a glimpse of the Revered Saint who made a grand entry on a vintage tractor which has has designed himself. On this occasion, the Revered Saint launched the trailer and a song from Jattu Engineer which was greatly appreciated and cheered by everyone in the audience. Speaking to the media on this occasion, the Revered Saint said that Jattu Engineer is a clean and entertaining comedy devoid of any vulgarity and sends a powerful message to the audience. The movie does not have a single double-meaning dialog. The central message of the movie shows how every village can become self-reliant through the determination of its people and can help the government in developing the country. The main purpose of the Revered Saint behind making this movie is to bring about a positive change in society. He also said that the censor board has awarded a U (or Universal) certification to Jattu Engineer which means that it is suitable for absolutely everyone regardless of whether their age is 6 or 60. In the movie, the Revered Saint plays a double role. One of the roles is of a school headmaster who helps transform a village while the other role is of a comedian who will keep you laughing on the edge of your seat. The movie showcases several languages including Hindi, Haryanvi, Punjabi, Bhojpuri and Bagri while demonstrating how people in any village can transform it positively with sufficient effort and will-power.In a special message, the Revered Saint has appealed to Sarpanches and public representatives from all over the country to watch Jattu Engineer. When asked about the recent controversy surrounding singer Sonu Nigam’s comments on the azaan, the Revered Saint said that no one should nitpick on any religion until they understand its depth and nuances. The Revered Saint also spoke about his double-role in the upcoming comedy film Jattu Engineer which releases on 19th May. One of the roles in the movie is that of a headmaster who comes to a village which has a school but no teachers. The movie shows the different issues that the people of this village face on a daily basis. The other role played by the Revered Saint in the movie is of a person who comes from among the villagers and works together with them to bring about a positive transformation.